It may be one game, but tonight will be a home-and-home. The NBA Developmental League's Greensboro Swarm began play this past season, and tonight, via an opportunity through my daughter's school, I'll be headed to a game. I've known this would happen for as long as the Swarm had existed, and in fact made soft plans to attend the game since I saw it on the schedule. It's happenstance that this is the game I'm attending, but it presents an interesting quandary: Who am I rooting for? Swarm-87ers isn't the only opportunity locally that pits hometown against current home. I've threatened for 12 years now to go see the Wilmington Blue Rocks play the Winston Salem Warthogs/Dash and root for the Rocks, though I've still not made that one happen. But while I grew up rooting for the Blue Rocks, the Sevens get my support only because they're based in Delaware (and, secondarily, because they're the 76ers' affiliate). I've never been to a game, and in fact they and I have never shared Delaware soil - the Sevens came into being in 2013, 14 years after I last lived in my home state year round. The Swarm, in contrast, are of the city where I now live, have started my career and am raising my family. They should certainly have my allegiance, but the pull of Delaware may prove hard to resist. I will root root root for the home team, but tonight may be a bit of a ceremonial transition. 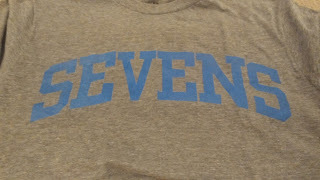 My in-laws got me a Sevens shirt for Christmas, and I will wear it proudly. But at the game, it is my intent to buy Swarm gear for my Greensboro native daughter, and who knows, I may even get some for myself. I have every intention of supporting the home team. It just may be a bit tougher when they're playing... the home team.